Join us at O’Malley’s for Ferndale 4 LIVE! Born in a basement sound studio in Ferndale, MI, the aspiration of the Ferndale4 is to find classic heartbeat songs that can be reinterpreted and reimagined with a signature style that fuses jazz, R&B and funk. Mining material from the American Songbook, Motown, Jazz, Pop and Soul, their repertoire is selective, eclectic and electric… paying homage to artists from Sinatra to Jarreau, Ella to Aretha, Nat to Stevie, and Gershwin to the Beatles. 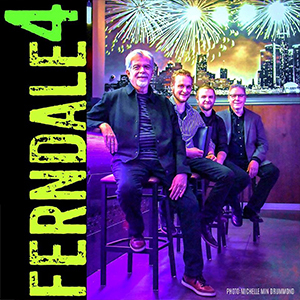 With “Songs you know, but never heard before” as their mantra, the Ferndale4 touches many generations, both in the band and in the audience, and keeps the room surprised and energized with each musical prize.